AquaMaxx BioMaxx Plus BioPellets are a hardened- cylindrical pellet that will improve water quality for fish and corals in saltwater aquarium. BioMaxx Plus BioPellets initiate a more efficient denitrification process that removes nitrate and phosphate from aquarium water. High nitrate and phosphate fuels algae growth and may negatively impact invertebrate or coral. 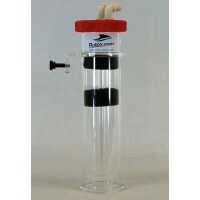 BioMaxx Plus BioPellets inside a fluidized filter (media reactor) will help to achieve maximum results and efficiency. 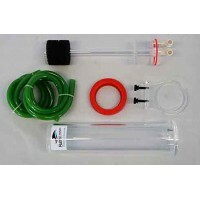 Use 0.5 to 1 liter of pellets for every 125 gallons of water. Make sure you start with a low dosage and increasing over time is preferable to beginning with a higher dosage. Be sure to rinse the media before use. We recommend soaking the BioPellets for at least 8 hours in DI water before adding them to the reactor. Fill your fluidized media reactor with the appropriate amount of AquaMaxx BioMaxx Plus BioPellets. Restrict the flow by using a ball valve (or similar device) to adjust the flow inside the reactor so that the BioPellets are suspended within the reactor chamber. The pellets should not be pushed to the to, but moving freely in the chamber. Check your media reactor once each day to ensure your BioPellets are still fluidized. The pellets will slough layers and decrease in size due to the tumbling action inside the reactor. Replenish your reactor every 3 to 6 months (or as needed) with additional BioPellets. AquaMaxx will warrant all AquaMaxx products to be free from manufacturing defects for one year from the original purchase date when purchased through an authorized AquaMaxx retailer. This warranty does not cover any damages caused by misuse, neglect, alterations or improper handling/transport/maintenance/installation. AquaMaxx does not cover personal injury, personal loss, or other damages associated with the use of these products.